A recipe for the festive season! (Cross-posted from my food blog, A la mode frangourou). Anyway to get back to my Russe, it’s something that I not only loved in childhood but now too. But I always thought I had to wait to get back to South-west France to indulge in it again. I thought it would be one of those sorts of cakes that would be too difficult to pull off for a home cook and so each birthday in Australia, I’d put in a request for my second-favourite cake, the Gateau Moka. This is also a gorgeous cake–a Genoise sponge layered with coffee butter cream, and David, my husband, has made it superlatively well for many years. But a Gateau Moka is not easy to make too far ahead of time and transport and as my birthday was going to be in Sydney this year, I knew I’d have to think again. I remembered seeing the ‘Swallow’s Nest’ cake in the Russian cookbook we bought in Moscow and thought, how about that, and then started thinking, that sounds a bit like a ‘Russe’–and then David said, well, meringue’s much easier to make ahead of time, why don’t I have a go at a Russe? He made me describe it and started looking up recipes–and then made his own version which turned out spectacularly well and which proved a huge hit at the birthday party! Here’s his recipe for a beautiful ‘Davidov’ which I think I’ll dub his version of the ‘Russe’! And it shows that a home cook can indeed pull off a Russe as well as any patissier–all my siblings, who’d tasted the ‘real’ Russes, agreed that it reproduced exactly the look and texture and flavours we all loved at Dodin’s! Ingredients for meringue layers and individual meringue rosettes for decoration: 10 egg whites, 400 g castor sugar, 2 tablespoons cornflour, 150 g hazelnut meal. 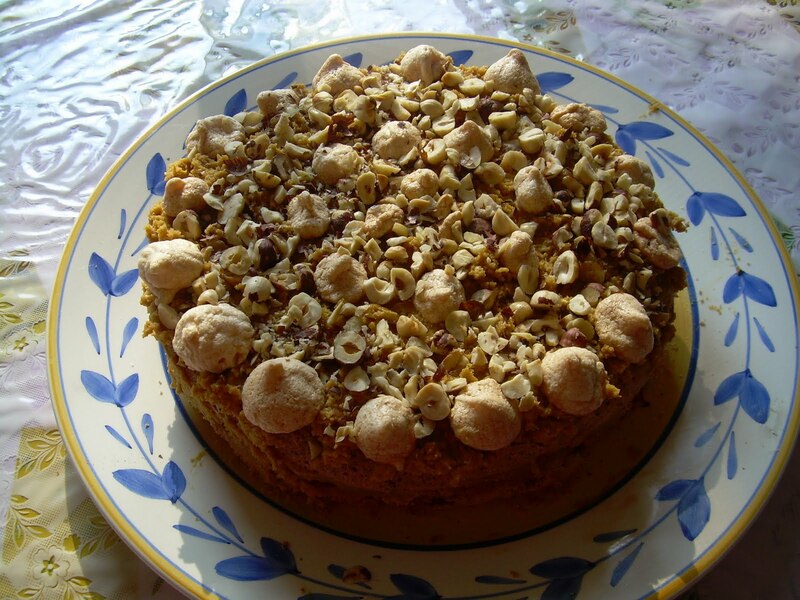 You will also need, for decoration on last meringue layer, some crushed roasted hazelnuts. Ingredients for coffee butter cream: 6 egg yolks, 450 g butter(David used a mixture of 300 g unsalted, 150 g salted, but you can use just unsalted if you like), 2/3 cup castor sugar, 1/2 cup hazelnut syrup(or light corn syrup, or pure maple syrup–David used the hazelnut syrup–Monin from France which can be used to flavour coffee etc), coffee essence or make your own as David did with 2 tablespoons instant coffee and two tablespoons boiling water–it should be a thick gooey mixture–you can also use a small amount of strong espresso). Putting cake together: Put the first layer of nut meringue on the plate, spread with some of the butter cake. Layer the next round of meringue, repeat, till you have used up the meringue layers and most of the butter cream(but keep some for the top and maybe the sides if you want. On the last layer, spread the rest of the butter cream, and decorate with the meringue rosettes and crushed roasted hazelnuts. ← Meet My Character–it’s a blog tour!